i went with their barrel at 16,5...i have had 2 GEN2 PSTs and like them but once the mirage comes up thats when they show their short comings as far as the glass goes. i run a kahlas 624i on my x47 so im leaning more towards the kahlas 318i but the ZCO scopes are going to be very nice too with a 36mm tube their glass coming from Schott and 35mils of elevation. the argos is a great scope for the price....mils are simple once you start using them...i shot MOA for 8-9 years then switched to mils it was an easy and helpful switch for me. as far as ballistics..drops..wind ECT its different than a center fire because EVERYTHING effects the 22 were a center fire is much more forgiving. every ammo you try is going to be a bit different...id suggest buying a bore snake and when you switch to a different ammo pull the snake through and then fire 5-10 rounds before you start shooting for groups. I have several .22 bore snakes including a brand new one just for the RPR. Between bore snakes and the Hornady ultrasonic cleaner I got a couple of months ago I no longer dread cleaning firearms. I will have to look online for some SK ammo. Those are my initials so I am already biased in favor of it lol. I bought 2k of SK Pistol Match Special a month or so ago. It shoots good but the Rifle Match is still better through all of my rifles. I'm holding on to it for now to see if the Vudoo likes it. The same thing for Federal Ultra Match, OK but no cookie. Same thing with Wolf Match, Ely Match and a few more. Initially last year before I knew any better I even ran all of the Supersonic ammo I had. The only type that really lived up to the name "Match" was Lapua Center X. My cleaning regimen for my 22 match rifles has dramatically changed over the past several months. They are all being treated and cleaned the same as my other high power match rifles now. I've been tweeking and listing to the rifles and I'm now a true believer. Cleaning rod and all the varied accouterments. How often are you cleaning and what are you using? Rod (and Rod Guide on bolt guns). The 10/22's all have a hole in the back of the receiver. Nylon brush and use the brush instead of a jag with a triangle patch to wet and pre-clean. VFG felt pellets with VFG adapter for deep clean, carbon ring cleaning and final pass. M-Pro 7 cleaning gel, JB Bore Shine, Rand Nano CPL, Rand Nano grease. Hornady 1 Shot Cleaner/Lube for the triggers when needed. I let the barrel tell me when it needs cleaning. On my RPR 6.5 it was 350rnds, on my 10/22's I see accuracy start to open up around 350-400rnds. I'm still learning about the 22 RPR. One of the matches I shoot each month is a 22 Benchrest. When you take time to make perfect shots in a match like that you learn lot about the rifles and ammo you use. It is crazy how fickle 22LR ammo is. It is also amazing that a caliber that has been around for 140 years and during that time is probably the most fired caliber cartridge yet there are so few accurate rifle options. my lijia barrel likes being clean...it shoots best from about 2-5 rounds to about 100-150 so i clean every time. bore guide..2-3 passes with a bronze brush on a dewy rod with montana extreme rim fire solvent..couple of patches with solvent..patch dry and done. im going to switch to bore tech solvent and the VFG pellets with the vudoo. I just received my VFG pellets last week and gave them a try this weekend. I'll still need to figure out exactly how I want to use those and probably a bit differently in the 10/22's vs the bolt guns. I didn't know anything about Bore Tech so I did a little research. I was interested enough to order some to try out. I haven't tried anything new for a few years now so it's about time. Tech is always changing and wile the chemicals I used 10 years ago were very good the 2 or 3 times I changed up over the years were very good decisions. SL, how is that build coming? 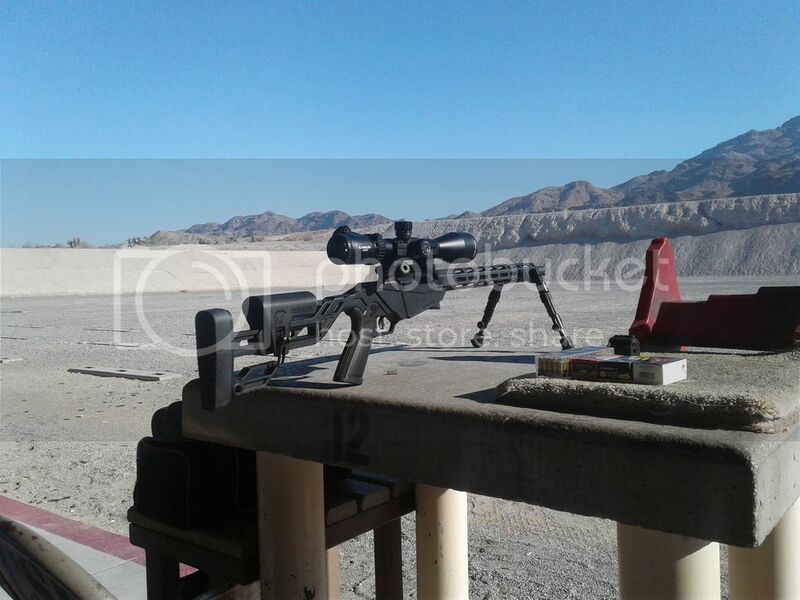 Are you ready for a range report yet? My scope, a bunch more ammo and few more mags should arrive Thursday. I'll be out at 0700 Saturday morning to give her a go! So how did your rifle turn out? Between unexpected engagements preventing me and sleeping in too late a couple of weekends I've yet to get to the range. I took this Thu and Fri off work for sh!ts n' giggles. So help me gun Gods I'll make it out at least once if not ever damn day tomorrow through Sunday! I made it out to CCSC this morning when they opened at 0700. I definitely dig this rifle and see a centerfire precision rifle taking a spot in my safe one day. Although I brought all 12-15 different brands/types of ammo I purchased, all I shot was CCI Standard, CCI Green Tag and Federal Gold Medal Target. 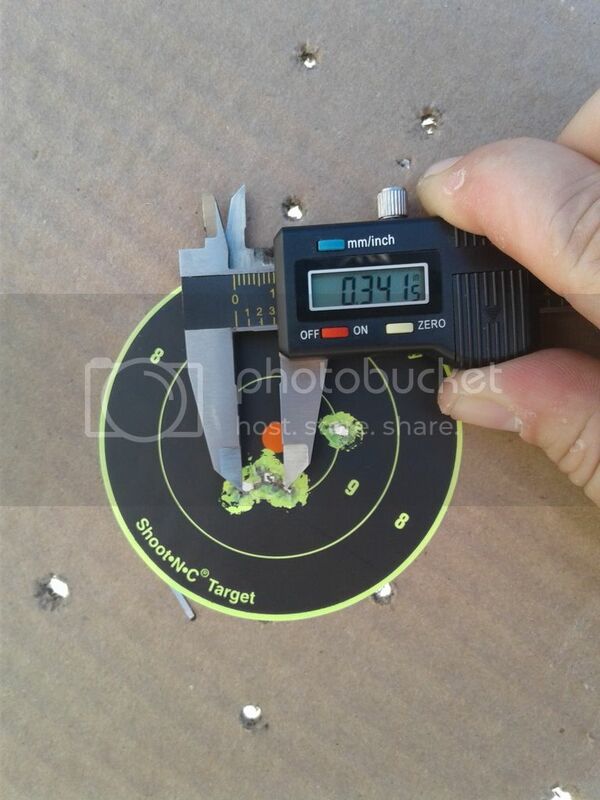 I was initially shooting about 3.5" high at 25 yards with the windage being nearly spot on (never adjusted it). I shot about 30 total rounds at 25 yards getting a feel for the trigger, adjusting the elevation and trying the 3 aforementioned rounds to see which grouped the best. The Green Tag was the best followed by CCI Standard and the Federal in a distant third. My worst 5 shot group was .975 inches with most being around .600 inches. All in all I think I did pretty well for my first time shooting a bolt let alone scoped gun in almost 10 years and am looking forward to learning more about precision shooting and practicing, practicing, practicing! It was my first time ever using a caliper to measure groups and do believe I measured a bit in my favor lol. I purchased Long Range Shooting Handbook: Complete Beginner's Guide to Long Range Shooting by Ryan Cleckner on my Kindle and am going to start reading it today. Thanks for the direction and assistance to y'all that answered my plethora of questions! Therein lies the frustration with 22lr, the flyer. In measuring it's easier to measure the outside of the bullet holes and then subtract the diameter of 1 bullet. You rifle should start shooting even better as you get 4 or 500 rounds down the barrel. Find your bullet and stick with it so that you condition the barrel with the oil/wax from that particular ammunition. If you change up it may take from 10-50 rounds to recondition the barrel to that particular ammo. Thanks for the tip QD! I recall you saying that your rifle liked SK Pistol Match. Is my memory correct? On my last trip out I discovered that my RPRim likes that ammo the best so far. I still have a couple other brands/loads I've yet to try. Once I have I'll either be buying more of the untested or a case of SK Pistol Match. All of my rifles like SK Rifle Match the best but the SK Pistol Match Special I tried was very close. Step up to more expensive ammo. CCI just does not have the QC to deliver amazing groups. It may do good, but it will probably take match ammo to ring out the most accuracy. The annoying thing about rimfire is the good stuff is pushing 20 per 50. For that price you can shoot .223. Fiochi 40 and 50 gr vmax for example comes in a 50 round box on sale for like 21 bucks, and it has been submoa in several of my guns. For a moderately prices but often accurate ammo try SK Magazine. It is the lots of SK + that did not meet QC standards.